Epson has introduced a new wide format photo printer, which is capable of offering gallery standard prints at up to 13 x 19 inches. 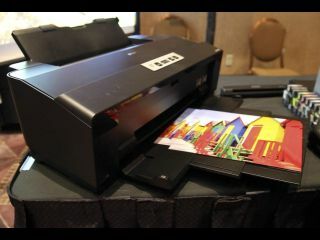 The Epson Stylus Photo 1500W is also capable of wireless networking and mobile printing. Epson's own exclusive Advanced MicroPiezo print head is combined with DX5 technology in the new printer, designed specially for accurate ink placement, smooth gradations and amazing skin tones. Wireless networking means that anyone on the same network can use the printer, while the Epson iPrint app allows users to print and share from a smartphone or tablet. Gallery quality prints can be printed on a range of borderless sizes, including 6x4 inch, 13x19 inch and 12 x 12 inch. Additional features include the ability to create smudge, scratch and water resistant prints that last up to 200 years in storage and up to 98 years on display under glass. A range of eco features and environmental qualities including Energy Star and RoHS compliance are also available. Adobe Photoshop Elements is bundled with the printer, meaning other projects including brochures, posters, photo enlargements and personalised CDs and DVDs can also be created and printed via the printer. The Epson Stylus Photo 1500W UK price is £349. It will be available to buy from March.